The Prime Day Deal on the Element 55-inch 4K Fire TV Edition Television for $399.99 has just gone live. If you’re even remotely considering buying this TV, put in your order immediately because this is definitely going to sell out quick. 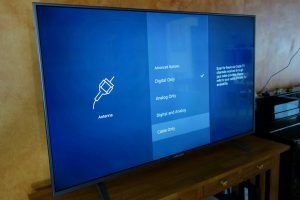 The Fire TV Edition televisions are already very well priced, so at nearly 40% off the regular price, this is a steal. I’m very happy with mine and I’m sure you will be too, especially if you can get one for this price. Check out the other Prime Day deals that are now live and check back here often because I’ll be posting all the best deals all night tonight and all day tomorrow. I just got it. When I first put it in my cart, it said $650, tried again, it said deal had ended, but then came back. Yup, same here. That happened with several items for me. Seems like things are a bit glitchy, but the purchases are going through correctly eventually. Good deal considering it has a FTV built in, but I won’t buy another tv that does not have HDR at this point. I’d read all those 1 star reviews before spending this much money. You know, I’m just checking, this does not mention what kind of tuner it has. Does anyone know if this has a QAM tuner? If not I’ll need to cancel. Yes it has QAM tuner. Are you sure? Do you have this TV? It would be great to get the unscrambled clearQAM channels from my cable. Can’t find any info about this on-line. In the TV’s advanced scan options, you can select “Cable Only.” That to me suggests it has a QAM tuner, but I have no way to test it out. Well got my TV today, YES it does find the cable stations! For some reason my zip code settings changed on the TV after software updated, so guide was all off. Scanning channels again, hopefully the zip code will stick.